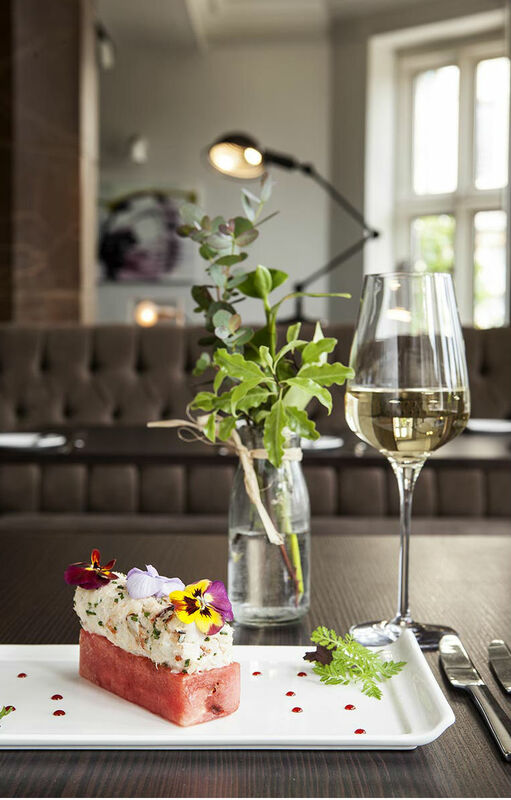 The two AA Rosette classic-contemporary bar and restaurant at The Alverton offers a relaxing haven for guests and visitors to enjoy a wide range of British favourites expertly cooked. Overlooking the garden and terrace, it is bathed with light during the day, whilst in the evening you can enjoy a more intimate dining experience enhanced by soft lamplight. Food is our forte at The Alverton. Enjoy our award-winning breakfast including the full works, smoked haddock or pancakes drizzled in maple syrup. During the day, grab lunch in the restaurant or a light bite in the bar, or why not sample our famous Afternoon Tea with delicate finger sandwiches, freshly baked scones and scrumptious cakes. On Sunday, tuck into a traditional roast for all the family. In the evening, indulge in our fresh seasonal dishes from Head Chef Simon George and his brigade. Choose from our extensive wine and Champagne wall, head into the bar and sip a refreshing cocktail, or in winter a rich espresso and homemade petit fours by the fire. Let us tantalise your taste buds and enjoy eating out in style at The Alverton. Food is served daily from midday until 9pm.